Reviews for The Saint of the Impossible: Everything you wanted to know about Saint Jude. If you are interested in learning more about the devotion that so many have to Saint Jude, The Saint of the Impossible: Everything You Wanted to Know about Saint Jude is most definitely the book for you. It is quite reader-friendly. The ancient history is presented in an entertaining manner. As for more recent times, I was delighted to learn about how so many famous people were also dedicated to Saint Jude, crediting the saint with helping them achieve the success that they prayed for and worked so hard to achieve. Most notable, of course, is Danny Thomas, who founded the famously charitable St. Jude’s Hospital. Also listed and quoted are Minnesota Fats, golfer Bobby Nichols, Danny De Vito, and Jamie Farr. The author also tells a fascinating story about Greta Garbo “who is said to have searched New York churches for a statue of Saint Jude.” Elvis Presley is also mentioned. You’ll also enjoy reading the happy results reported by ordinary people. J. Arena, Top 500 reviewer. 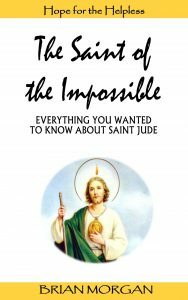 No matter what your religious background, you may find what you are looking for in The Saint of the Impossible: Everything You Wanted to Know about Saint Jude. Satisfy your curiosity, find a new way to grow in faith, or learn from the history — highly recommended! Comment on Kindle version verified purchase. Another person found this helpful. Heart Warming story about Saint Jude life and suffering. Several Prayers for Saint Jude and a Novena with a commentary from the writer who worked 50 years part-time in the completion of the book. The author also invites comments from readers with his personal e-mail address or questions. He asks the readers for a word of mouth recommendation if they like the book. [The book details] Saint Jude’s works and the writer’s loyalty to a Saint with such a turbulent life. By Shalizeh, Kindle Verified Purchase. A nice read about a special Saint. Brian Morgan did a nice job on this book about Saint Jude. It could not have been easy to write particularly after losing all the research he had done over many years when he moved. Talk about the patience of Job! I would highly recommend it for anyone who would like to learn more [about] this special patron Saint of the Impossible. John B., Kindle verified purchase. Great book about Saint Jude, Saint of impossible and hopeless cases. You have to believe. Please make him known. Tell to everybody. Abraham Castro, Kindle verified purchase. Like to return from The Saint of the Impossible to the Published books page?